What follows is a visualization exercise to help you find perspective and develop awareness, appreciation, and authorship for your life’s journey. This will involve painting a mental picture for yourself and then looking at it in three distinct ways to learn and grow from the experience. Doing this will come naturally to some and will be more difficult for others. I recommend that you make notes or sketches as you are visualizing or that you describe what you imagine to your therapist. This exercise can be done to help feelings of anxiety or depression, as well as other mental health concerns, both in and outside of therapy sessions. Imagine that the difficulty you’re facing in your life is a terrain or landscape. 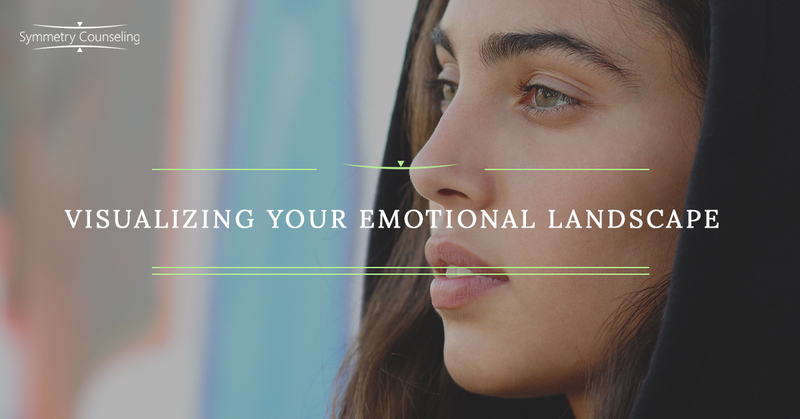 This terrain may be mountainous and steep, a sprawling desert, a stormy ocean, a murky swamp, or whatever scenario occurs to you where the emotions and worries might mirror those of your real life anxiety or other mental health concerns. In visualizing your landscape, there are a few questions you might ask yourself to fill out the mental image. How long have you been here? Who is with you? Are you going or staying? What is the obstacle you are faced with? Is it physical? Is it a relationship? Is it time? Take some time to think about the stressors in your life and then work them into your landscape. Maybe your project at work is like a wild stampede and it’s a struggle just to keep up. Maybe your marriage is like being on opposite sides of a chasm. Maybe an addiction is like quicksand. Maybe your financial situation is like treading water with sharks circling. There are so many ways to visualize your landscape with the anxiety or stress in your life. Choose one and work on developing it as fully as your imagination permits. Again, you may choose to write some of your thoughts down, make sketches of them, or talk through them with your counselor during therapy. In order to overcome your imagined challenges and the real challenges in your life, there are three ways of looking at the situation that can help. Look inward, look outward, and look at the big picture. What will be required of you to get through this challenging landscape? Patience? Courage? Strength? Trust? Creativity? Although your real-life situation and your visualized environment may look different in many respects, often the character traits and skills needed to overcome obstacles are the same. Although our real-life problems may sound less exciting or adventurous than our imagined scenario, they are still opportunities to develop yourself as a person. With your life, you are creating a story. Create one that matters to you. Encourage and root for yourself as you would your favorite character in a story. Each struggle, whether it is with depression, relationship issues, or something else, is not only an opportunity to solve a problem, but it is a chance to develop your own character and maybe create a story that will inspire others. Developing this ability to visualize and express your anxiety can be helpful in overcoming challenges. Furthermore, when you begin to understand and appreciate the role of other people in your life (be they family, friends, or your therapist), your life can feel richer and more purposeful. If you would like to address your struggles with one of our experienced counselors, please contact Symmetry Counseling to set up a therapy appointment.